This home is third generation. My great grandmother lived here with her husband, then my grandmother with hers. My mother, however, eloped with her husband and they chose to live in New York City. As soon as I graduated high school, I ran as fast as I could to live in Georgia, the most beautiful state in the union. After five years of marriage, my husband said it reminded him of a prison and left to find greener pastures. Friday Fictioneers is a challenge hosted by Rochelle Wisoff-Fields. She give us a photo prompt and challenges us to write a story of 100 words or less. Thank you Lrod. Wasn’t real happy with it but couldn’t think of anything else. I can understand why he would think it to be a prison. Sometimes, when living in suburbia, that feeling can take hold. If the houses look similar or are the same, it does seem like you are trapped. I like how it started off sweet and homely, then ended completely different. I enjoy stories that use both sides of the coin! It is perception isn’t it. Lovely porch to one casts a shadow of prison images to another. Nice job Priceless. Great take on the prompt – a there is a lot going on in those 100 words. I’m glad your narrator found her Eden, albeit at the cost of the relationship. So true, so true. The bum might realize it and go back. 😉 haha! sadly, it happens in any relationship. it takes two to make it work. I understand that it does. That’s what I have heard anyway. Now that I think about it after you said that, it sounds like she married a man like her mother. Thank you Ady. I just couldn’t think up anything else for that picture. Thank you Ady, you are so sweet! One of these days I will write happier stories. LOL! Very sad, each one unwilling to compromise. Nice story. You’re right Sandra. Neither one willing to compromise. Thank you for reading and commenting. Its funny how your heaven can be someone else’s prison, but that is life. To each his own. We all try to carve our niche in this world. The only thing we need to be careful is not to let our priorities make things difficult for someone else. Clever last words. Interesting how we all like different things and go our own way. I agree with you. It is amazing how unspoken words can scream so loudly from their silence. I have to wonder how stable the marriage was to begin with. People change and grow, sometimes we grow in opposite directions. . I perceive a very smooth flow in a story. The ending leaves a strong impact upon the readers mind. Yes, the ending is sad. They say that women have a tendency to marry men that are somewhat like their mother. Apparently, this woman did. PJ why are you stepping back from writing your Ff stories? I am thinking about taking some time away from WordPress. Thank you for asking. Shame they separated but it looks like they wanted different things. You’ve encapsulated the very essence of Friday Fictioneers. We may all be viewing the same picture, but that doesn’t mean we see the same thing. Fantastic. Thank you Carol, that was kind of you to say. Yes, we all see things through different lenses. That, to me, is the fun part of Friday Fictioneers. I absolutely love reading the flash fiction of you and others who are actual “writers.” And you all have been kind and patient with me, who is not. I won’t be submitting any more of my tidbits on FF, but I truly wish you the best in all your future writing endeavors. I’m not sure you can call me an actual writer, but thank you for the compliment. Why are you stepping back? Thank you for asking. I need to concentrate my time on learning how to write better. It’s been a lot of fun and wonderful meeting all the participants. If that is what seems best for you then good luck. I wish you all the success in the world. Thank you Carol. I appreciate that. The photo is beautiful and the story of a lost loved not able to appreciate a shared love. I loved how you managed to fit so much history in such a short amount of words. Great story! Thank you so much. 🙂 I appreciate you reading and commenting. It doesn’t look like a prison to me. We’ll take the east wing. When can we move in? Oh, by the way, I like my eggs over easy so they blend well with the grits. Ham or sausage, either is fine. We’ll see you on the veranda at breakfast. No chicory in the coffee, please. Anytime! It’s somewhere in Georgia. Haha! I wonder if he ran to New York City… To each his own I suppose. Thank you Rachael, yes, he ran to New York and got with her mother. LOL!! Sadly this happens way to often.. and I guess the summers was could be a little clammy in Georgia. I have never been to Georgia but I have been to Louisiana and I imagine the humidity is about as bad. It could easily become clammy under such a situation. 🙂 Sadly, yes, it happens much too often. On Wednesday, Rochelle sends us a photo prompt and we all write a story 100 words or less based on the photo (it can be about anything, just refer to photo some way). When we publish our stories, we link it to her post through the blue frog InLinkz. Then we can click on the blue frog box and it takes us into the web page that has all of our stories. You will see all of our blog icons in squares on the page. When I click on the white part (where the title and blog name is) it takes me into that person’s story. Sometimes they type it at the very beginning and sometimes they type it (write it) right under the photo). But each story “should” have the same photo attached. Does this make sense or have I confused you more? I really love Friday Fictioneers but the majority of the writers are professional writers (authors) and I feel WAY UNQUALIFIED to participate. I am thinking about not writing for Friday Fictioneers anymore because of this. In fact, I am “mulling” around starting my own Flash Fiction for people that are learning to write better (not professionals), where we can read and help each other with our writing. But I don’t know how well this would go over with people. I’ll have to give it some thought. It would be quite the commitment I’m not sure I want to make. There’s more to it than just starting it up. PLEASE DO NOT QUIT WRITING FOR FF! You are an amazing writer! I would definitely participate if you started your own Flash Fiction for those learning to write – because that is what I am, too! Really Kirsten? You would join? I am seriously thinking about it. I want to poll people and see if they would be interested. It would be for people that are non-professional writers, and more for those of us who want to learn to write better. Hopefully some people who are wonderful writers will join and help those of us who want their help in improving. My problem is when I go visit my children and grandchildren, I would need someone to take it over for those two weeks. That is what bothers me is the commitment and whether I will be able to fully take that on. That’s a great idea! I hadn’t thought of that. I will ask what people’s preferences are in my post. Now, I need to think up what to write. I hope so! Now I am getting excited about it. You have such a gift for packing a multi-layered story into 100 words! The last line is amazing – “My Eden, his prison.” I’m glad your character has her Eden! Beautiful as always! Thank you. I appreciate your comments – a LOT!! Thank you. PJ, wonderfully told story. What we sacrifice for love and adapt to each other’s lives. I guess in this case that wasn’t possible. You say you’re not a professional writer but this was really good. Thank you Adam. I appreciate you reading and commenting. I am still learning! That is a beautiful porch! 😉 the story is such a sad reality, “we see what we look for”- it all depends on our perspective. You are right about that! “We see what we look for.” Thanks Ameena!! Yes, it does illustrate how different people are according to their tastes. (I envy you living in a secluded place). Her husband was a bit like her own mother who didn’t want to live in the house and moved to NYC. I hope it didn’t come out too harshly. It sounds like it must have and that wasn’t my intention. Actually, I didn’t realize her husband was like her mother until after I wrote and published it. Thank you Millie. I am glad to know that it didn’t come across as too negative toward the mother. It was mainly to stress the point of what is wonderful to one may not be wonderful to another. Which is how i saw it, so you did a really good job with it, PJ. Thank you Millie. I really appreciate that, because I have really been struggling with feeling so inadequate as a writer. Any encouragement I get is welcome. I have started a Flash Fiction for Aspiring Writers (I know you are not aspiring because you are an accomplished writer) but we need mentors on the challenge and I would love for you to be a mentor if you have the time. If you feel up to it, follow the website I just created for it (it will only have a weekly post for the challenge so you won’t be getting other emails from it). Join in (you are welcome to write a post when you want to). I am having everyone tag their posts, “Flash Fiction for Aspiring Writers” so they can be found on the WordPress Reader under this tag. I’m going to look into joining InLinKz so we can all post onto that in the near future. “Wistful” is the first word that came to mind after I read this. How true this story is that so many of us allow the unimportant things in life to drive our decisions. Thank you for reading Michael, and I agree, many people allow the unimportant become important and make unwise decisions. I blame it partially on inexperience and immaturity. Thank you for commenting! No, he belonged in NYC with her mother! LOL!! Also, Nan, thank you for the sweet comment. I felt imprisonment in this photo prompt also. That is interesting that you felt the same thing. 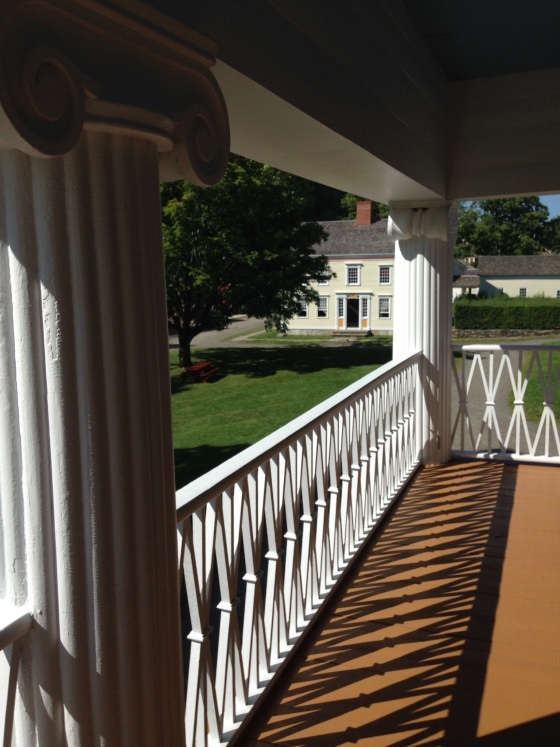 My focus was on the railing and shadows that were casting on the porch. Thank you for reading and commenting! Another story that raises many questions…I wonder if the narrator is really happy in her Eden. Tough choices! The double-edged view of the lovely balcony/prison bars is very clever. I am a mere newcomer to Friday Fiction but I do hope you’re not leaving. Do value your comments and stories. I would love to take a look! Very nice story of attachment to one’s land. I like that change a lot! I guess even a beautiful home can seem like a prison if you can’t do the things you really want to. liked the voice, the sentiment, and the moral. Very well told. So sad to read that they couldn’t be happy and share her vision of Eden. Sad for her, but really, she has her Eden, and that’s got to be good. I’m sure she’ll find someone else to share it with her if that’s what she needs. Lovely story. I like this – beautifully written! You’ve shown well how two people will have totally different perceptions. It also showed which meant more to her as she obviously stayed in her Eden. Heritage long-lived marriage somewhat shorter. Yes, she decided to stay there while he decided to leave. A very short marriage for this couple. She seemed to marry someone like her mother. (I have always heard this often happens, although I didn’t mean for that to be part of the story). Running in circles, finding our own corner of the world, just to find it suffocating. I like how you waved it, her mother running away, she running back and then her husband leaving. Although she calls it an Eden, I wonder if with time it might become her prison, too. I like your story very much. Thank you so much. I have considered leaving Friday Fictioneers only because it seems everyone there are such wonderful writers and I feel my writing is “groan” worthy. I don’t want to waste Rochelle’s time or the other peoples time there, and I feel like I do. I want to improve my writing and then go back and feel like my stories are worth reading. Thank you for your feedback on my story. I really do appreciate it. Nicely done. I loved the last line. How true!